What is it? A beat-em up based on the popular Nickelodeon TV show. Reviewed on: Windows 7, Intel i7@3.00Ghz, 8 GBs RAM, Nvidia GTX 680. I’m running up the steps of Air Temple Island when another mob of equalists attack and I only have my fists to defend myself. Breaking the fourth and final pot of spirit water, I unlock my waterbending and instantly feel like the badass I should, tearing through the foes that were holding me back. The feeling put into perspective just how strong Avatar Korra could really be, and it was the first moment of The Legend of Korra in which I was really having fun. The Legend of Korra mainly consists of beating up tons of dudes, walking a linear path to the next area, and then beating up some more dudes, trying to rack up combos and find hidden treasures along the way. After a dejecting first level strips Korra of her bending—powers that give her control over Water, Earth, Fire, and Air—forcing me to attack with clunky, short range punches, I was worried the combat wouldn’t live up to the presentation. I quickly discovered, however, that the reality was the opposite of my concerns. The Legend of Korra game is based on the cartoon show of the same name, now in its fourth season on Nickelodeon. Although the channel is primarily for kids, the show itself tackles some pretty adult themes and targets an audience older than Nick’s usual mark. Nickelodeon’s recognition of this audience is clearly reflected in its choice of developer Platinum Games—known primarily for frantic and violent beat-em ups—which has managed to match the attitude and intensity of the show almost perfectly. As to be expected with Platinum, the combat is far and away the most fine-tuned part of the game. The blending of four unique fighting styles is smooth and satisfying—and when coupled with dodging and counter systems, each fight becomes a dynamic experience that looks and feels like a scene from the show, while leaving me lots of room to perfect my technique. The fighting is broken up by an occasional endless runner style mini-game on the back of your polar bear-dog, Naga. The change of pace is appreciated, but the inclusion of obstacles that instantly kill me—forcing me to restart the level an arduous amount of times—make these sequences needlessly frustrating, especially one towards the end of the game which had me shouting at my screen. As a fan of the show, The Legend of Korra is an absolute treat to play. The plot, although light, is a brand new story that takes place directly after the events of season two, and each of the hidden collectables is a faithful callback to a memorable episode. However, not all references are treated with such care. Only two important characters, including Korra, appear for a substantial period of time, though they thankfully have the correct voice actors. The glaring lack of most of the lead characters and the poor use of the show’s other personalities and locations didn’t ruin the fan experience, but it was difficult to look past. 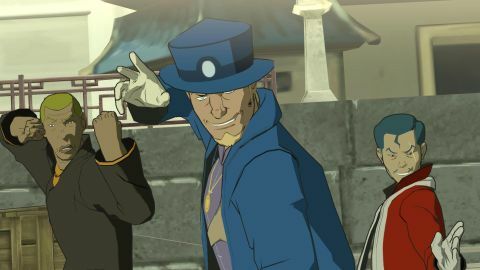 There are only a handful of enemy character models, a fact even more obvious to fans of the show when secondary characters—specifically members of the Triad Gang—are faithfully recreated before being reskinned and overused as part of The Legend of Korra’s incredibly limited enemy pool. Likewise, the level design is beautifully cel-shaded on first glance but quickly wears thin as you start to see the same assets used many times over. This reuse hurts the otherwise engaging combat, as it frustrated me to put all my effort into fighting a chapter’s boss only to have that fight trivialized when it becomes a regularly used enemy in the next chapter. With only eight chapters, the story mode can be completed in around five hours but encourages a second playthrough in its New Game+ extreme mode. This harder setting ups the difficulty by increasing the number of enemies while raising their health, and at first it presented me with a significant challenge. However, by the third chapter I had finished maxing out the power of my moves, turning every fight into a rapid left clicking contest. The extreme boost in strength I gained from reaching a bending style’s level cap removed any sort of strategy the fights had previously required, and was made worse when I discovered max level fire-bending would auto-jump to the next target. I felt more like a Super Saiyan than the Avatar. This is only Platinum’s second game to release on PC, so it’s disappointing but not surprising to find the graphical settings are limited to say the least. The Legend of Korra has a max resolution of 1080p and the choice between two graphical options: normal or smooth. That’s it. Additionally, there is no way to customize key bindings, presumably because it expects and heavily encourages you to use an Xbox 360 controller. While it does control better with a gamepad, the mouse and keyboard controls handle just fine, and only slip up on a few ill-advised bindings. Overall, The Legend of Korra’s PC port performs well, but will only perform with the settings Platinum wants it to. Or smooth. As a fan of both the show and Platinum Games’ signature beat-em up style, The Legend of Korra was a short but satisfying trip into a world I love hearing stories about, well worth the appealing $15/£12 price. However, if I weren’t already engaged in the story, the flat, repetitive levels and lackluster attempt to explain the game’s world would be much harder to overlook. All this, combined with its port being functional but extraordinarily limited, make the PC version of The Legend of Korra is an amusing but disappointing experience.